Lewis University is a Catholic university offering distinctive undergraduate and graduate programs to more than 7,000 traditional and adult students. Lewis offers multiple campus locations, online degree programs and a variety of formats that provide accessibility and convenience to a growing student population. Sponsored by the De La Salle Christian Brothers, Lewis provides students with customizable, market-relevant and practical degree programs that are immediately applicable to their careers. With small class sizes, students receive individualized attention from faculty who are experts in their fields and bring real-world experience to the classroom. Online students are assigned a personal Student Services Coordinator who guides them through their entire academic career at Lewis University. Lewis University is a regionally accredited, not-for-profit university committed to student success. With small class sizes, you get more individualized attention from supportive faculty who are experts in their fields and bring real-world experience to the classroom. Lewis is a small school with a big impact, producing a community of graduates who lead the world in protecting human rights and advancing social justice. 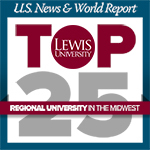 Lewis has been named a Top 25 “Regional Midwest University” by U.S. News & World Report. You will have access to the same experienced faculty and customizable curriculum as our on-campus students. This convenient and effective format allows you to pursue your advanced professional goals without interrupting your current career. As an online student, you are assigned a personal Student Services Coordinator who will guide you through your entire academic career at Lewis University. Click here to learn more about Lewis University's online master's degree programs or call (866) 967-7046 to speak with a Graduate Admissions Counselor.